A 2009 alumnus has given RIT $50 million, the largest donation ever made to the university and one of the largest ever in the region. 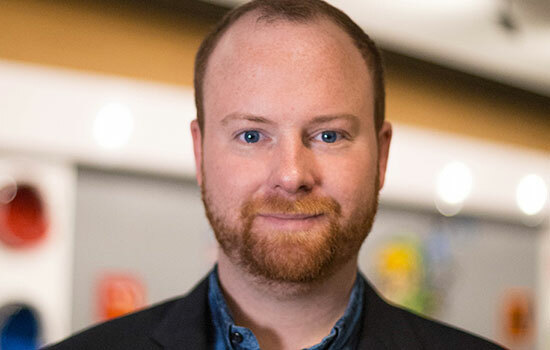 The unprecedented gift comes from Austin McChord, founder and CEO of Datto, a Connecticut-based data protection company. A 2009 alumnus has given Rochester Institute of Technology $50 million, the largest donation ever made to the university and one of the largest ever in the region. 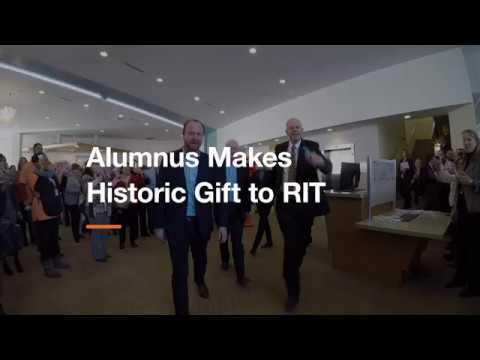 McChord, an RIT trustee, said he was inspired to make the donation by former RIT President Bill Destler, with whom he has developed a friendship. Destler, who retired as RIT president in June 2017, was in the audience at RIT’s Student Innovation Hall as McChord announced his gift. 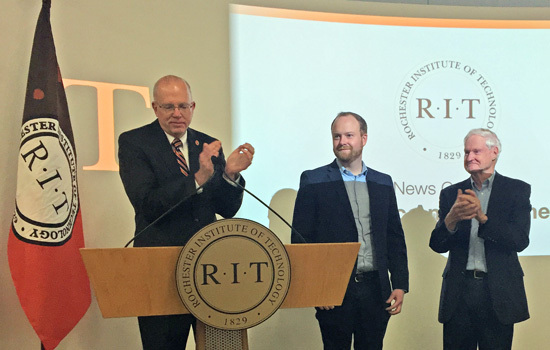 $30 million to foster creativity and entrepreneurship at RIT, including $17.5 million to launch the Maker Library & Innovative Learning Complex of the Future. This will be a new facility connecting RIT’s Wallace Center and the Student Alumni Union. Additional funding will go toward purchasing equipment and endowing faculty positions and student scholarships, including new “Entrepreneurial Gap Year” fellowships to help students advance their concepts into businesses. McChord has been an active alumnus of RIT, serving as a frequent keynote speaker at events, including Venture Creations graduation, the annual Entrepreneurship Conference and the 2017 Commencement. Datto sponsored events such as RIT48, an entrepreneurship competition, and hackathons, and McChord has given of his time as a mentor in RIT’s SummerStart program, an intense summer program aimed at assisting entrepreneurs/innovators in developing their business concepts to a point where they are ready to begin to seek angel investment. McChord founded Datto, a global provider of Total Data Protection Solutions, in 2007. Starting with an idea he had while a student at RIT, McChord started the company in the basement of his father’s office building. His original goal of building basic back-up for small businesses across the country has expanded dramatically over the past 10 years. Datto has experienced exponential growth, appearing on the coveted Inc. 500 list of fastest growing private companies in 2012, 2013 and 2014, and has been recognized by the Connecticut Technology Council as one of the state’s fastest growing companies. The company has also received numerous industry awards for company growth, product excellence and customer support. In August 2014, Datto opened a branch in downtown Rochester on the fourth floor of RIT’s Downtown Center, at 40 Franklin St., becoming the first company in the region to join that state’s START-UP NY program. Initial plans called for Datto to add 70 workers within the next 18 months, but Datto has already grown to more than 200 employees in Rochester. McChord has said he expects the company’s Rochester operations, which also has offices on multiple floors of The Metropolitan (former Chase Tower), to continue to grow. McChord’s business success has earned him several honors. The holder of several patents, McChord was named to the Forbes 30 Under 30 list in 2015 as a leader in Enterprise Technology and won the Ernst & Young Entrepreneur of the Year New York Region Award in 2016.